If you've ever taken an interest in poetry, you might've been intimidated by all the technical terms. In truth, some are more integral than others. 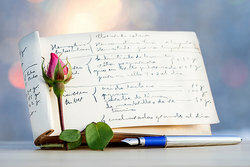 The key is not to take a big bite out of a poetic dictionary but rather start with a small foundation. The rest will come naturally as you continue to embrace this form of art. To get you started, here are 20 essential poetry terms to know, from alliteration to trochee. Alliteration is a fun sound device to play around with. When used well, you can create a standout phrase in poetry. It is a simple yet effective repetition of initial consonant sounds. An example might be "the cerulean sky" or "the flighty fox." An allusion is a reference to a person, place, thing, or event. Typically, writers allude to something they suppose the audience will already know about. The concept may be real or imaginary, referring to anything from fiction, to folklore, to historical events. An anaphora is the repetition of the same word or phrase at the beginning of each line. This is done for emphasis and typically adds rhythm to a passage. In Joanna Klink's poem "Some Feel Rain" the phrase "some feel" is repeated throughout, creating a nice rhythm. each other in the whiskey dark, scarcely there. Assonance is the repetition of vowel sounds within a tight group of words. This, too, is done for emphasis and can reinforce a central message. Here's a short example from Carl Sandburg's "Early Moon." Notice the repetition of the vowels O and A. "Poetry is old, ancient and goes back far." In blank verse poetry, we usually see iambic pentameter that doesn't rhyme. We'll still enjoy a line with 10 syllables where the first syllable is unstressed and the second is stressed. There just won't be an aim to rhyme the lines. Wallace Stevens' "Sunday Morning" is an excellent example of a poem written in perfect blank verse. Dactyl is a metrical foot containing a stressed syllable followed by two unstressed syllables. A well'known example of dactylic meter is Alfred Lord Tennyson's "The Charge of the Light Brigade:"
In literature, this is a short verse or quote that appears at the start of a poem, book or chapter, after the title. Typically, it touches upon a theme the poem will elaborate upon, as in Joel Brouwer's "Last Request." An epigraph can also be used as an opportunity to provide a summary or background information. A foot is a basic unit of measurement in poetry. It usually consists of two or three syllables. The most common feet in poetry contain either a stressed syllable followed by an unstressed syllable (trochee) or an unstressed syllable followed by a stressed syllable (iamb). This is one of the most common metrical feet in poetry. It consists of an unstressed syllable followed by a stressed syllable. Words like "attain" and "describe" are iambic. We don't stress the first syllable and the second one is more pronounced. Iambic pentameter describes a pattern wherein the lines in a poem consist of five iambs, making up a total of 10 syllables. This means the line reads as an unstressed syllable, then a stressed syllable, then an unstressed syllable, and then a stressed syllable for ten beats. William Shakespeare's "Sonnet 18" contains iambic pentameter. In this example, notice there are 10 syllables. The first is unstressed, the second is stressed, and so forth. Meter is the rhythmic measure of a line. It defines the pattern of the beats. Meter is often interchanged with foot and feet. In poetry, you can use the following terms to describe the number of feet in a line. Rhyme scheme refers to the pattern of rhymes at the end of each line. It's annotated with letters. For example, a four-line stanza with an ABAB rhyme scheme means the first and third lines rhyme and the second and fourth lines rhyme. Rhythm is the beat or movement of a line. This includes the rise and fall of, say, an unstressed syllable followed by a stressed syllable. English (Shakespearean) Sonnet - Three quatrains and a couplet, usually following a rhyme scheme of ABAB CDCD EFEF GG. Italian (Petrarchan) Sonnet - An octave followed by a sestet, with rhyming iambic pentameter and a volta (turning point) around the eighth line, usually following a rhyme scheme of ABBAABBA CDECDE. Similar to how sentences make up a paragraph, a group of lines make up a stanza. A stanza is usually named based on the number of lines it contains. For some, a love of poetry can develop more slowly than for others. Whether your love dribbles in like rain or flashes down like lightning, it's important to know the "lingo" so you can fully understand and discuss poetry. What do you say? Will you give it a try? Why not put a Shakespearean twist on a modern day sonnet? Here are some tips on writing poems. Happy writing! "20 Essential Poetry Terms to Know." YourDictionary, n.d. Web. 23 April 2019. <https://examples.yourdictionary.com/20-essential-poetry-terms-to-know.html>. If you’ve ever taken an interest in poetry, you might’ve been intimidated by all the technical terms. In truth, some are more integral than others. The key is not to take a big bite out of a poetic dictionary but rather start with a small foundation. The rest will come naturally as you continue to embrace this form of art. To get you started, here are 20 essential poetry terms to know, from alliteration to trochee.